Thorpe Market is a small parish less than 4.5km from the North Norfolk Coast. The parish is dominated by Gunton Park, a large 17th or 18th century landscape that covers a large area to the south. The name ‘thorpe’ is derived from the Old Norse word for hamlet, and Thorpe Market is a correspondingly small parish with few archaeological interventions. Evidence for the prehistoric period has been recovered in the form of a small number of Neolithic flint axeheads (NHER 6756, NHER 6757, NHER 35340) and one flint flake (NHER 23819, NHER 30438). Although no objects have been recovered from the Bronze or Iron Ages, however there have been a number of cropmarks recorded by aerial photography. This includes a number of Bronze Age round barrows (NHER 36485, NHER 36481, NHER 38504) as well as a possible Iron Age field system (NHER 38499). A number of features from the Roman period have also been recorded. These include a possible farmstead (NHER 17739), a possible temporary army camp or settlement (NHER 36483) as well as field boundaries of Iron Age or Roman date (NHER 38551). A small number of Roman objects have also been recorded. As well as the common pottery sherds (NHER 36172) and coins (NHER 37438, NHER 35340), part of a bucket mount (NHER 35033) and a hairpin (NHER 30318) have also been recovered. Evidence from the Saxon period is very sparse, with pottery sherds (NHER 21267) as the only objects recovered, and there are no known monuments. Despite this, Thorpe Market features in the Domesday Book, which also notes the presence of a church in the parish. However, the current parish church of St Margaret (NHER 6765) was built in the 1796, although it is believed that the Late Saxon period church also stood on this side. Excavation in 2002 discovered the foundations of the 15th century tower, confirming the presence of a medieval church on this site. It is thought that along with the now rebuilt church a medieval building may also have been present on the Thorpe Hall site (NHER 6764). It is believed that this medieval great house sat within a large area of field boundaries and trackways (NHER 38515). Also of possible medieval date are some possible medieval field boundaries (NHER 38624), just east of the village. A small number of objects from the medieval period have also been recovered, including some pottery sherds (NHER 23819), coins (NHER 41097) as well as a horse harness pendant (NHER 35033) and a key (NHER 30318). Similar objects from the post medieval period have also been recovered. The post medieval building of most interest in the parish is perhaps the church of St Margaret (NHER 6765), which is particularly important as an example of the Gothick style. 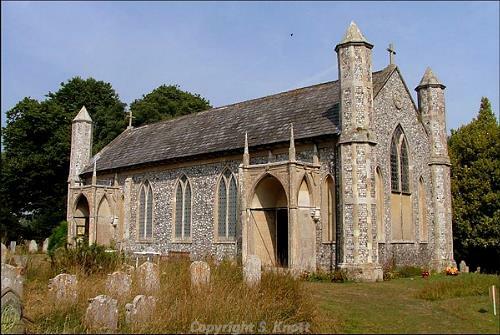 Built at the end of the 18th century, it is almost unique in Norfolk, where hardly any churches were constructed at that time. Some minor alterations took place in 1892, but the church retains its original design. Aerial photography has also recorded the cropmarks of a number of post medieval features, comprising trackways (NHER 38515) and field boundaries (NHER 38993). In addition, English Heritage has listed a number of buildings of architectural interest. These are largely situated in the village or nearby, such as Green Farm (NHER 14093), a house of around 1575 with large octagonal chimneys. Interestingly, during World War Two a water pump behind the house was converted into a Lewis gun post. Other evidence from the World Wars includes two rare World War One pillboxes (NHER 16794, NHER 28842), and two possible pillbox sites (NHER 16795, NHER 38523). Of slightly earlier date is the Cromer Line of the East Norfolk Railway (NHER 13586), which cuts the parish to the east and was begun in 1867. The line is still in use, the parish being served by the small Gunton Station, which was originally built to serve Gunton Hall. Gunton Park (NHER 30438) still covers some of the parish, as do a number of features recorded as cropmarks (NHER 38499), which most recently show activity associated with Gunton Park, but may have originated in the Iron Age. Ruth Fillery-Travis (NLA), 21 February 2007.